A once in a lifetime catch. March 27,1972 my 23 Ft. Hurricane and I went fishing. Easy passage through Florida's StLucie Inlet and headed NE trolling four lines one was wire line with a sea witch I made with double hook for King Mackerel. The other a skirted Balao and trolled long. Two outrigger lines one for a teaser to make a commotion the other with a skirted Balao trolled short. My only action all day 8 to 4 was to keep the lines free of grass and check the condition of the bait. A beautiful but slow day. Standing on the engine box looking over the canvass top I noticed something different and changed course on the auto pilot. Trolling through the area resulted in three lines going down. Slowed to idle and kept moving I boated two small school Dolphin about 4#. (The fish, Not the mammal) Rebating I turned north and turned to troll south between the 12 and 12A buoys to head home. It was now 4:25 and 18 miles to the inlet so I started to pull in the lines. I had the wire line in and rod stored when the Starboard outrigger line snapped off and the Penn International 30 reel screamed in protest as the fish zipped off. I glanced at the reel and looked back in time to see a big splash with the biggest Dolphin I ever saw. I remember saying, "Wow what a fish". I stopped reeling in the flat line and went for the pole with the fish but he was in his second run peeling line off at an amazing rate. I slowed the boat to idle and picked up the pole to set the hook or test the hook up but when I did he rocketed out of the water with a high twisting jump. I had all I could do to keep a tight line. To get home before dark I had to put on the pressure hoping he would cooperate. It took about 20 minutes to get him alongside but too far to reach with my 6 foot aluminum gaff. I kept the pressure on and finally reached out and gaffed him. I thought. He exploded into action and under the boat almost pulling the pole over and bent the gaff about 45 degrees as he went under the boat. I do not remember which I did first but I grabbed the pole loosened the drag to keep the pole from touching the hull and dropped the gaff in the boat. I then reached the controls to back the boat off the line that I held as deep as possible to avoid any barnacles on the hull that could cut the line. Luck was with me and to cut this short when I had him close again he was astern swinging back and forth left to right and two more the same size were with him. An amazing sight. I finally gaffed him and pulled him into the boat between the engine box and hull and pushed the fish box up against him, but he was finished. Raced back to the inlet and pulled into my dock as it was starting to get dark. He was 5 foot long and 61-1/4 LB.. His eyes were about 4 inches in diameter. I was ahead in the tournament until the Sundance charter boat caught one a slight bigger. Wonderful memories. Let me first introduce Louie Puskus captain of the Gracie II the best Tuna captain I know. In the early days of my fishing when I would close my store on Wednesdays and go fishing I ran South East from Manasquan Inlet and the seas were like a mirror not a ripple. I tried every thing I knew to get a response from anything that lived in the ocean. No luck. I talked to Louie on the radio and he had some Tuna South of my position and I kept running to the South. Finally I saw something playing with my teaser and watched for some time before I realized it was a Marlin. I called Louie and told him and he came right back and said bring up the bait and remove the teaser. (He did not say you dope) Well I did but it was too late. The Marlin was no longer interested. I kept running South and did you ever hear the deafening sound of silence? My engine conked out and I was like 30 miles SE of Barnegat Inlet that is 18 miles South of Manasquan Inlet. Never in my life have I ever heard such silence. Nothing, not a breeze, not a ripple on the water, just complete nothing. To keep the lines from tangling in slack water I reeled in all the lines and opened the engine cover and went to work. Before I did I called Louie and gave him my Loran Numbers and when I did he said you are only about 8 miles from my position. (Louie later told me he said to his party that a buddy was in trouble and he had to go help and the party all agreed.) As I worked on my engine to find the cause of the stoppage I was about to change the condenser on the points when I heard "How you doing?" I almost jumped out of my skin because I had heard nothing until Louie spoke. I had to laugh then and tell him that I had this one more thing to try before I gave up. Louie said OK and circled my position and told me later I had more Tuna where I was than he had earlier. Anyway I got the condenser installed and the engine started and ran like a top. I called Louie and told him I was heading back to port and took off. I did not run far and ran into a bunch of Tuna and stopped to rig and fish. When Louie saw me stop he called and asked if I had more trouble and when I told him I had Tuna he said you are something. That is the way it was with buddies on the ocean. We would be on call anytime to assist one another. I wound up with about eight or nine school Tuna like 6 to 8 Lbs. And delicious any way you made them. I cold packed Tuna all summer when available to eat all winter. I was approximately 50 miles from home when engine trouble developed. I always carried spare parts just in case. Memories…..
Have you ever seen a Tuna Clipper? These are boats of size that fish all over the world for Tuna and they have complete processing plants on board. My friend John, on the Atlantic Ocean Maid, was introduced to me by Louie Puskus, Captain of the Gracie II, on the air and we collaborated at times to help one another. Mostly me. A clipper can be 110 Ft long and stored on the stern ramp is about a 30 Ft open boat that has a special purpose. Tuna clippers use airplane spotters to help find schools of Tuna and when they do find a school a whole plan unfolds and it is most interesting to watch. When the clipper runs alongside the school, upwind of the school, (and this is important) the open boat on the ramp is released to drop back into the ocean with its engine in reverse to hold back because a steel net is being deployed that is fastened to the bow of the open boat. The clipper plays out the steel net as it circles the school of Tuna and any other fish with the school. Rifle men on the deck stand ready for action if needed to shoot sharks that may be trapped in the net with the Tuna. When the clipper has completed the circle and the net is secured by the open boat the clipper runs down wind of the net and stops abreast of the net to start retrieving the Tuna caught in the net. The open boat is holding the net from drifting to the clipper and the clipper is being pushed by the wind away from the net that follows. Then a big open end net is lowered into the circle of fish. The lower end of the net is closed to entrap fish and the net with the fish is raised into the clipper and dumped on deck to start the processing. I do not have the detail of the processing, but I am sure it is most efficiently done. If any sharks are spotted they are shot because they are most dangerous on board. This process goes on until all the Tuna are in the clipper. These boats can be at sea for months to make a catch. Foreign countries are competing with our Tuna clippers for Tuna and it is becoming a real problem not only for the fishermen but also for the Tuna. More memories…. This is fighting a 110 pound Yellow Fin Tuna The only fish caught on this trip to the Bicardi wreck. 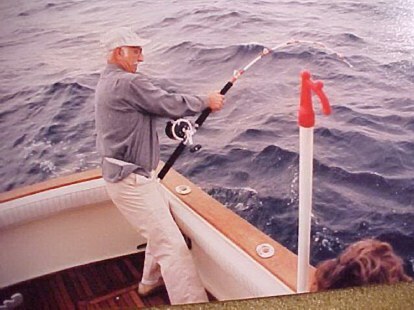 Grouper fishing: I have to relate this catch because it was not my doing and it changed the subsequent catches of Grouper for months.~ Jack Whitaker Captain of the HOBO boat out of Jensen Beach, Florida loved to talk on the radio while chartering a party on his HOBO (The Red Boat). One could see his boat for miles because of the red color. One day while I was Golden Tile fishing in 640 Feet of water I heard Jack say, "Good Lord what's that down there?" We all kept our radios on all the time in case any of us need help or whatever. My ears perked up and waited for another from Jack. After about five minutes Jack said, "Can't find my Grouper rigs, somebody did not put them back." I then went on the radio and offered to take him Grouper rigs I have. No answer. Nothing else for a few minutes then, "Good Lord 30 to 40 pounds, double headers.
" WELL! It took me no time to bring up my rig and take off to where Jack found the fish I could see him from where I was fishing. As I approached the area Jack came on the radio and asked me to swing around in front of his location and freeze the loran numbers because his loran just conked out. I did just that and the cloud of fish I saw on my recorder was mind boggeling. I dropped my rig and before it even got to the wreck I had two on. I stayed as long as I could to help Jack but I finally had to tell him I had to get back to keep the fish from spoiling. I had my fish box full and thirteen fish on the deck I had to keep watering down with the salt water pump to keep them fresh. Jack answered that he had enough and was quitting also. What a day. I radioed my wife to call Don to meet me at the refueling dock to pick up my catch and Ann biked over to see as well. I unloaded at the dock with a croud OOHing and AHHing at the catch. 600 Pounds of Groupers that were about 30 pounds each. I went back the next day and caught another 400 pounds. Don could not handle any more so I stayed at my dock for a few days cleaning my boat. When Jack put this on the air the result was that boats from West Palm and Fort Pierce converged on the wreck and cleaned it off. Those fish turned out to be our breeders so it took months before we caught Groupers of any size at any of our fishing spots. This was back in the early 80's in 540 foot of water. Memories.. Sometime between 1968 and 1971 Phil and I left Manasquan Inlet to try for whatever in my 23 Ft Hurricane Boat. When I cleared the inlet I called Louie Puskus on the radio to check on what was going on. Lou was the captain on the Gracie II, one of the best Tuna Charter boats in the area. Lou came right back, BUT let me tell you something about Louie Puscus. Back in the 1890's there was a big fish kill of Golden Tile fish up and down the East Coast. It was believed a cold water influx did the job. Anyhow the industry was desimated. Lou wandered what was going on with Golden Tile in about 1968 or so and decided to look for them. The result was that he not only found Golden Tile but started a real revival by buying a bigger boat etc. to take advantage of the fish return. Lou today is doing well. OK getting back to my call to Lou, he informed me that there were Tuna sighted off Asbury Park feeding or jumping. We headed that way and saw the Tuna acting like Porpoise jumping. No matter what we tried we could not hook up so decided to head out to deeper water. We did not go more than three or four miles when we hooked up. It did not take long to realize we had a big Tuna on and we had to run with it to conserve line. Phil took over the helm and I the rod. Big Tuna do not give an exciting fight except that they sound at the end of the fight and hug the bottom to make it hard to raise them. After some 40 minutes we boated the Tuna shook hands and went on. This was my first large Tuna. 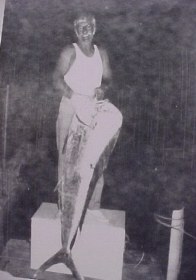 See a picture of the 90 Lb Tuna on 'My Boats" page. I have a story that is most unusual. It was to me at the time and still boggles the mind. Have you ever heard of the Bermuda Triangle? Well it is real and I fished in it for years with no problem, however the "Mary M" fishing boat out of Port Salerno reported one day that on the way out he ran into a situation where the sea, the sky and the air all turned yellowish and his compass started to spin. The captain turned back on his wake which was the only thing he could see and held the course till he got out of the mess and continued back to port. I don't know what may be available on the web on the Bermuda Triangle but several large ships and crews have been lost without a trace. Commercial planes have disappeared and a squadron of Grumman TBM 3's was lost without a trace. Think about it. Comment if you have any info to add. It is weird. It is there! See Favorite Links Page for URL for the Bermuda Triangle. Ever see a BIG sea turtle? I had an area I fished several times in about 225 foot of water straight off StLucie Inlet. I would run out to the depth and turn north holding the depth. Almost every time I would get some kind of action when doing this. One day I saw a huge Sea Turtle just setting on the surface sunning. He must have been at least 4 Ft. in Diameter. Any salt fisherman knows that something on the surface could mean something hiding under the object whatever it might be. So I ran out my flat line far enough so that I could turn without alarming the turtle so as to drag the bait close to it as I circled. Sure enough I saw a school dolphin streak out from under him and grab the bait. An excited Dolphin becomes florescent, they literally light up and are easy to see. I had a ball for about an hour catching Dolphin 4 to 6 Lb. I guess I had about 6 or 7 before the turtle sounded. To explain why fish hide under something on the surface the something casts a shadow and the fish hide in the shadow so other fish below them will not see them. Weed lines are famous for fish to hide under so I would troll beside a weed line hoping to tease the hiders out. Memories.